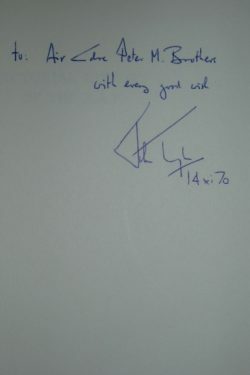 Ian Allen First Edition 1970. 208 pages with hundreds of photographs. Very Good condition hardback book in blue boards with a Very Good condition dustjacket. Clean, bright and tight. 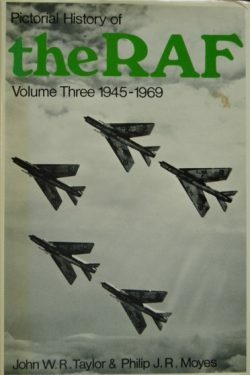 An excellent history of the post-war RAF with a fabulous selection of photographs detailing the numerous aircraft types, bases and theatres of operation of the RAF. As we celebrate the 100th anniversary of the formation of the RAF, it is sobering to dip into these pages and reflect that this book was published shortly after the 50th anniversary and see how much, and how little, has changed…. Pete Brothers was a distinguished Battle of Britain pilot and fighter leader. He flew with 32 Squadron and Bob Stanford Tuck’s 257 Squadron before being given his own commands including the famous 602 Squadron. He finished the war with more than 16 victories, 10 of which had been scored during the Battle of Britain. Postwar, Pete enjoyed a varied RAF career and more recently was President of the Battle of Britain Fighter Association. He was a genial and popular veteran at various commemorative events until his death in 2008 aged 91. An interesting book from the personal library of one of ‘The Few’.